Admitting it was “weird” to deny Leishman the home title he craves so badly, Smith dedicated his win to close friend Jason Young who is battling a brain tumor and the family and friends in the gallery who urged him on to victory. 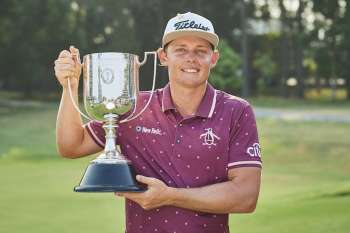 When Smith was victorious at Royal Pines 12 months ago it signified a breakthrough individual title and having had to wait a year to win again, is determined to establish himself as a regular winner on the US PGA Tour. “One of my goals that I didn't tick off this year was missing out on that win over there,” Smith said of a PGA Tour season that boasted four top-five finishes and three more top-10 finishes. “I still played great over there. I put myself in position to win and didn't quite pull it off a couple times, and that's just going to happen when you’re competing against the best guys in the world. Joining illustrious names in Australian golf to have won successive Australian PGA titles, Smith should move inside the top 30 in the world in the official rankings this week but has set himself an even loftier goal for 2019. “I would love to get into the top 20 by the end of next year, it's definitely the next goal,” Smith said. “That's the next big step for myself, to get myself in there and get myself in a lot of situations where I can win golf tournaments. When Smith won the Joe Kirkwood Cup for the first time last year he was ranked 61st in the world and attributes his continued development not to any drastic changes but applying greater focus to each area of his game and preparation. “I've put in a lot of hard work and I've just stuck to my kind of process and goals,” said Smith. “Stuff I have to do during the week, sticking to a schedule in my off weeks, which is something that I never did. “All that stuff, and then getting stronger in the gym. I'm hitting the ball probably 10 metres further off the tee this year and it's just allowed me to be a little bit more aggressive into the greens.